It seems that while standards appear to be falling everywhere, we are constantly told they are at an all-time high. But, whose job is it to improve standards? We take a look at organic food production and how it works. No organisation, company, government or individual knows it all. Everything changes, discoveries are made, inventions created, pests and weeds evolve, weather patterns fluctuate. In any competent agricultural movement these changes need to be constantly reviewed, and organic standards and rules need to be modified to take account of these changes. As knowledge about organic farming develops, better practices and principles are discovered and we understand more about the way the planet works and how organisms interact with each other. Organic standards need to change to ensure members of the organic movement are doing the best for their chosen goal – saving the planet while keeping us alive and not forcibly vegan or eating space food – although the ice cream does look convenient. That is the great thing about having organisations and individuals who are willing to take care of reviewing and disseminating information about necessary changes, it means hopefully that the organic movement does the best it can with the information it has available. That it doesn’t get stuck in its ways “well this is the way we’ve always done it, it’s the ‘organic’ way”. For organic agriculture to be successful its practices need to be ‘organic’ - to be capable and willing to change. And if that means, one day, probably many years from now, that GMO is a good thing?! Then that’s something that will have to change too. I’m not counting my chicken though, unless they do get the vote, when they will hopefully form an orderly queue. The Soil Association are currently reviewing their standards and adapting the way they present their information so it is easier to find, follow and understand. They are also giving farmers and businesses more choice on how they reach these standards, so they can develop their own methods of tackling a problem while staying within the framework of the Soil Associations standards. They are also making it clearer on why they implement certain standards, why it is important they are adhered to and the hopeful implications on creating such standards. 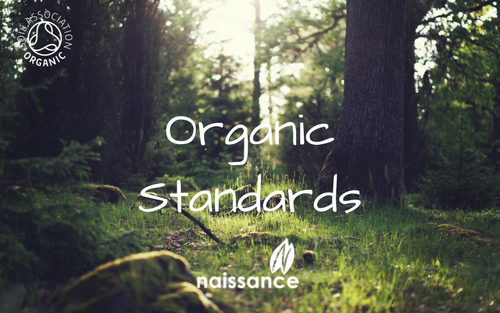 What do you think – Should governments or NGO’s lead the way with organic standards? Please share your thoughts with us. Coming up Tomorrow… Soil Association Certification News - The question is, do you trust everything you are told? Well the chances are you are more likely to trust something that is written, than something that is said. In the same way that we are more likely to believe something that has been promised when we see physical evidence of it. It’s only human nature after all. Naissance Staff Top Aromatherapy Picks Part 1 - We asked our staff what their favourite oils were and why, so they could share them with you. There were some interesting answers in the mix which you may find useful.